Recent release “Circle Home West” from Page Publishing author David S. Walker is both intriguing and thrilling; this work depicts the roller coaster of the unpredictable as an average man’s life is turned up-side-down. David S. Walker, a teacher, outdoors enthusiast, traveler, Native American historian, devoted writer and author, has completed his new book “Circle Home West”: a philosophical, in-depth work that delves into the rituals and beliefs of the Native Americas. Published by New York City-based Page Publishing, David S. Walker’s fascinating book explains the heritage and strength of the Native American’s through the narrative of the main characters, Clint and Marianne Anderson. 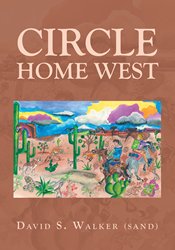 “Circle Home West” is an old-fashioned cowboy and Indian tale set in the New West. A contemporary Western novel, the book is the story of Clinton Anderson, a long-haul truck driver, the last of the American cowboys. Like the cowboys who saddled horses and followed the cattle trails of the Old West, the modern cowboy outfits his truck and rides the interstate highways of the New West. The radio serenades him with romantic song and fast talk, seducing him like a barroom whore in a Saturday-night saloon. Marianne, Clinton Anderson’s wife of fourteen years, believed that Clint’s truck had become his home and his mistress. On a cool Pacific Northwest autumn morning, after leaving his marital bed, Clint Anderson walked out of his small Puget Sound bungalow not knowing what lay ahead. To him, it was another workaday, mundane Monday morning. But fate would have it different. He would head out from Seattle on a routine long-haul run to Denver, only to find himself hijacked and deadheading headlong into the new Wild West! Readers who wish to experience this insightful work can purchase“Circle Home West” at bookstores everywhere, or online at the Apple iTunes store, Amazon, Kobo, Google Play or Barnes and Noble.